The next 8-week MBSR/MBCT Mindfulness Course will be based in Knocklyon and will start on first Monday in October 2017, 7.30pm - 9.30pm. Course FULL. This eight week course is based on the widely researched international curriculum that represents the gold standard in mindfulness training for stress reduction. Each session involves a mixture of mindfulness meditation practice, short presentations on the theme for that week by the facilitator as well as some group discussion. (Please note that only courses of 8 weeks duration and at least 2 hours per class are recognised as MBSR or MBCT). This course is facilitated by Graham who holds a Masters of Science in Mindfulness Based Interventions awarded by University College Dublin (UCD). While mindfulness does not claim to be a cure for anything, a growing amount of research indicates that it can be very beneficial in supporting people experiencing stress, low mood or chronic pain conditions. For those who practice mindfulness regularly, it provides a toolkit to skilfully manage life's inevitable stresses as well as promoting insights that encourage better self care. These MBSR/MBCT programmes are run to the highest standards by a rigorously trained mindfulness teacher committed to a strong personal practice and adheres to the Good Practice Guidelines of the Mindfulness Teachers Network of Ireland. Further information about MBSR/MBCT programmes. A commitment to the 8 weeks and daily home practice for the duration is necessary to fully benefit. A pre-course questionnaire and/or telephone interview will form part of admission onto the programme. The programme is not therapy, although there may be therapeutic benefits for anyone that participates. If you would like further information or to book a place on this programme, please fill out the form below, email Graham at connectingmindfullycourses@gmail.com or contact 087-1877977. 8-week programme includes Course Orientation, a comprehensive Course Handbook, 3 x Mindfulness Audios, and a Day of Mindfulness (weekend day). Cost €260, payment plan available. 4-week Introduction to Mindfulness costs €150. Other mindfulness courses also available - please get in touch for details. 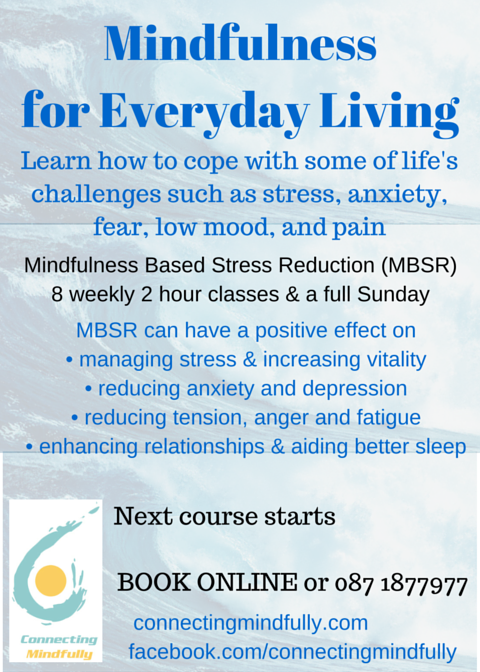 Reduce Stress with Mindfulness 8-week Course Starts October. Experience the many benefits of MBSR Training. Early Bird Savings Register Today. "I had the pleasure of completing an 8 week MBSR and MBCT Course under Graham's exceptional guidance and expertise. Having played around with some mindfulness apps previously ...... "